I'm sure you have all heard of ice hotels, ice lounges, ice bars etc. But did you ever wonder how they are actually made? Who makes them and how? Today you are going to find out! Hidden away in a small town near the shores of Lake Huron is Iceculture Inc., the company that makes the special clear ice used by ice carvers & ice bars. And we are going to get a special inside look at the Iceculture factory with a presentation, a tour of the plant, an ice carving demonstration and then enjoy the ice lounge. $120.00 per person, HST extra. Round trip transportation on highway coach to Bayfield, Hensall and Grand Bend. Guided tour, ice lounge experience and ice carving demonstration at Iceculture Inc. included. 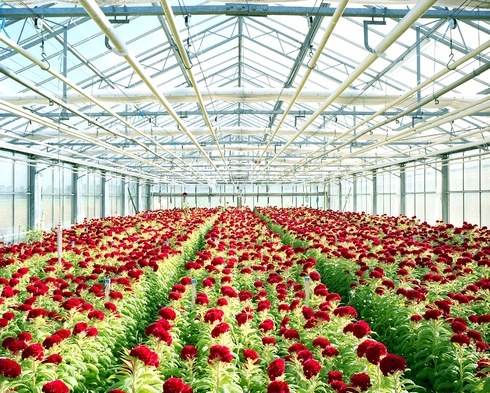 Guided tour and shopping time at Westland Greenhouses included. 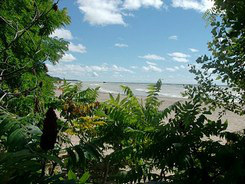 Visit to Bayfield, Ontario included. An elegant dinner at the Schoolhouse Restaurant in Grand Band, Ontario included. Vegetarian & gluten-free options available. There are 4 pickup locations in the Toronto area. Milton, Hwy 401 & Trafalgar Rd. Children 10 and older are welcome on this trip. Price is the same as that for adults. Browsing, shopping & lunch in Bayfield, Ontario. Our first stop is the beautiful village of Bayfield, Ontario. We will get to stroll along Main Street. and check out the cafes, restaurants and art galleries. You may wish to purchase lunch from one of the many outlets or alternatively, the sandy beaches on the shores of Lake Huron are just steps away so if you prefer to bring your own picnic lunch you can do so and just walk down to the beach and enjoy a nice picnic. 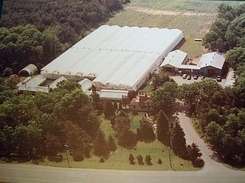 After our break in Bayfield, we now drive to Iceculture for our private tour of their factory. Iceculture has designed and built 20 ice lounges around the world – from Dubai, Thailand and South Africa to Australia, New Zealand and Spain. We will learn how crystal clear ice is manufactured and processed and then transformed into an endless array of fascinating designs. We will also watch a private ice carving demonstration just for our tour group, and see CNC technicians operate the computer-controlled routers and lathes in the company’s freezer studio. We will also get to visit the special ice lounge that has been constructed on the premises where we will don our insulated cape and gloves (so that we don't freeze!) 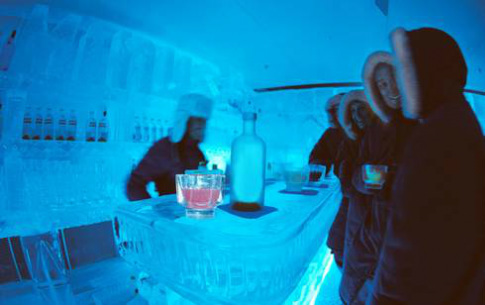 and get a chance to experience ice paintings, as well as an ice bar, ice furniture and other decorative elements. Our third stop today is Westland Greenhouses, one of the largest greenhouses in this part of Ontario. We will get a guided tour through the greenhouses and you will have the chance to wander through 3 acres of plants and flowers. Westland carry a big selection of tropical indoor plants. cacti, succulents, ferns, all kinds of blooming plants, pots, insecticides, perennials and grasses. If you have ever wanted to pick up that one special plant and needed to speak to an expert, this is the place to do it! And finally, after our tours, we arrive at the lovely Schoolhouse Restaurant in Grand Bend for our elegant sit-down dinner. Tonight you get to have a wonderful plated meal, surrounded by memorabilia and pictures celebrating Grand Bend’s history. Grand Bend Public School opened in the fall of 1874. It remained as an active school for over fifty years, until 1925 when a new school was built and the building became a private dwelling. 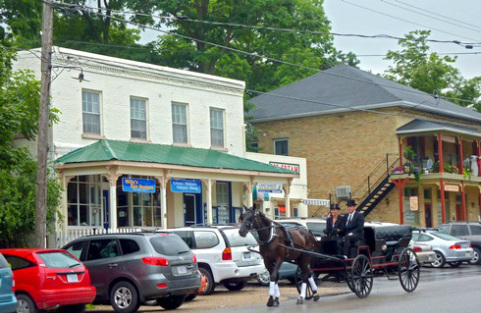 Today, it stands as a nostalgic reminder of Grand Bend’s past. has been cooking for over thirty years. 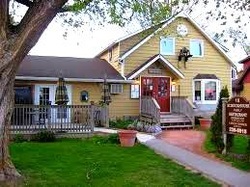 His past accomplishments include a four star rating from “At The Plate” and contributing chef to “Flavours of Muskoka.” He has published his own cookbook entitled “Cooking With Gusto at the Schoolhouse Restaurant,” which features stories about life working in a kitchen and recipes from the Schoolhouse Restaurant. Gus will be offering up a number of dinner options this evening including pecan crusted stuffed chicken, Dutch oven pot roast with traditional slow roasted AAA Black Angus beef and pan gravy. farm raised white basa fish, ratatouille and the very flavourful nasi goreng. 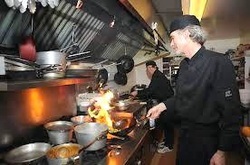 Our dinner service includes tea/coffee or pop, soup or salad, the main entree and a dessert of the chef's choice. Alas, all good things must come to an end and so will this day. So after our dinner, we will reluctantly board our bus to return to Toronto after another wonderful outing to the hidden gems of Ontario. I hope you enjoy coming along on these trips as much as I enjoy putting them together and being your host and I look forward to seeing you on this one. We leave Toronto on Saturday morning at approximately 8:00 AM. Actual pickup times vary by stop and will be sent out in the final email to all registered attendees, 2 days before the trip. We return to Toronto at approximately 10:00 PM on Saturday night.